I’m not someone who likes lists, all sorts of The best films…, The worst films… etc I never saw a point of social media getting obsessed with someone’s subjective opinion, with someone they have never even met or heard of rating a particular film at the top of their list. I have been asked whether I could put a list of my top slow films together, but I will do it differently here. First of all, I’d like to thank the over 52,000 people who have dropped by this year. Of those, over 24,000 were unique visitors, new people who have discovered The Art(s) of Slow Cinema. The blog is now five years old. I changed servers last year, so I no longer have statistics for every year. But I think that this year has been the strongest in the blog’s history and I reckon around 200,000 to 250,000 people have so far viewed the blog since October 2012. These are abstract numbers, they quantify what’s going on on the blog. To me, those numbers show the growing interest in Slow Cinema / Contemplative Cinema. It’s not my work the people come here for. I know maybe 0,5% of those who drop by. It’s their interest in this type of film that brings them to The Art(s) of Slow Cinema, away from standard writing, from standard analysis. Those people want to discover what’s beyond the already-written, the already-said, and that makes me very happy. I will keep going for as long as I can, and you can help me with that by supporting the blog on Patreon. 2017 has been a year in which I did not discover single films as such, but rather almost entire oeuvres. I looked through my posts and noticed that, unconsciously, I returned time and again to the same directors; Wang Bing and Chantal Akerman. That was completely accidental. I usually try to vary my writing, but those two directors demanded more attention from me. I watched 4 films by Wang Bing alone; 15 hours of material that really struck me. I started of with West of the Tracks, Wang Bing’s nine-hour long documentary about the collapse of the Tie Xi Qu industrial complex. It was my first long film by the Chinese director, and the more films I watched by him the more I became fascinated by how much you can do with so very little. For those who know Wang Bing, it is a well-known fact that he often works clandestinely, with a small handheld camera and no real crew. He simply records what he sees. West of the Tracks is a masterpiece that was for me this year the perfect introduction to Wang Bing’s work. I had seen one or two of his works before, but that particular film had the effect that I had missed until then: the desire to see more. And so I did; Bitter Money, a superb film about young migrant workers trying to earn a living in clothes factories; Three Sisters, a look at the life of three sisters, aged 10, 6 and 4, who live alone in the mountains as their father is a migrant worker in a city nearby; and Mrs Fang, a film that was my personal discovery of the year. If someone really forced me to name a Film of the Year, it would be Mrs Fang. My aim for next year is to see and review Crude Oil and Till Madness Do Us Part. That would complete my journey through the lengthy works of Wang Bing, and I really cannot wait to see more films in future (although they do take up a lot of time!!). The second director who stayed with me throughout the year was Chantal Akerman. It is perhaps the coincidence of my embarking on a journey through my family history during the war that brought me closer to the films of Akerman, films that are full of history, memory, and trauma. Of course, there are films in which those themes are not as present. But the two films I did see this year (I should have seen more!) 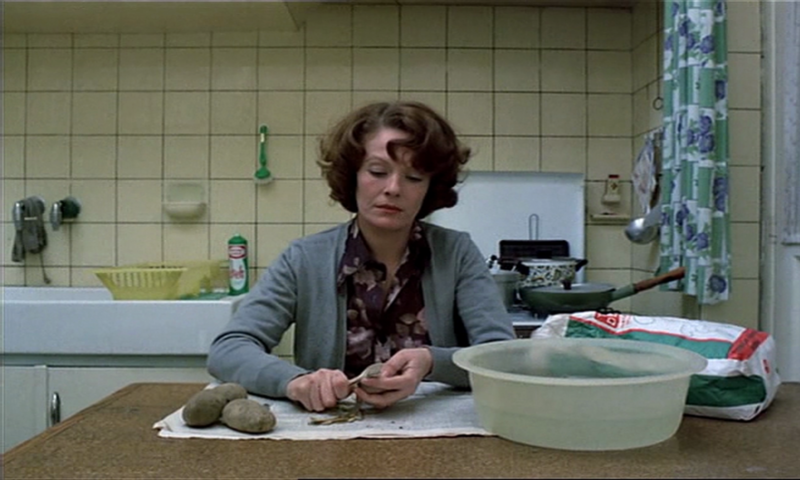 had those very much at their centre; No Home Movie, Akerman’s last film, and News from Home, albeit the former is much more explicit on this and, perhaps with Là-bas, the most explicit film about the family’s past. News from Home is, now that I think about the two films in retrospect, a great companion piece to No Home Movie, a sort of mirror image. Akerman left Belgium to live and work in the US. The film shows us images of the United States in the 1970s. We never see Akerman, but we do hear her reading letters she had received from her mother. There was anxiety in the words of Akerman’s mother; anxiety about whether her daughter could make it, about whether money she had sent had arrived, about not hearing from her daughter for a long time. There was a distance that could only be bridged by letters. Then there is this moving scene in No Home Movie, with Akerman filming a Skype call she had with her mother: “I want to show that there is no distance anymore.” Akerman’s portrait of her increasingly frail mother is superb and, in some ways, went well with Wang Bing’s Mrs Fang. Wang Bing and Chantal Akerman hardly make for cheery films. And so my counterpart to all of this was the Living trilogy by Swedish director Roy Andersson, comprised of Songs from the Second Floor (2000), You, the Living (2007), and A pigeon sat on a branch reflecting on existence (2014). With seven years in between each of the films, Andersson took his time to craft a superb trilogy on the human condition, on our mundane lives, our mundane struggles, and yes, also about our WTF actions, actions that make you go “yes, we do this but why the heck are we doing this in the first place?” The Living trilogy is one of the few slow films (or slow film compilation) that come with a lot of humour, even though it’s dark humour. It’s not that often that we find cheery slow films. It’s usually Albert Serra who makes up for the lack of humour in Slow Cinema. This year, I learned that Roy Andersson joins the rank of slow clowns, and I still have all his short films to watch! Very much looking forward to seeing more by Andersson in the next year. Then there was the marvellous Five by Abbas Kiarostami, which I finally had the chance to watch, and it was one of those experiences that are difficult to forget. It’s primarily the last sequence that still stays with me, the long take of a lake at night, the moon light reflecting on the surface until dark clouds cover it and a storm arrives. An absolutely superb observation of a perfectly natural phenomenon, but filmed in a rather obscure way so that, for a long time, one wonders what’s happening. Outside my director studies this year, Five was the single most interesting film I have seen in 2017. Overall, 2017 was a good year for slow films…at least on my blog. I have also read quite a bit. There was this great book about contemporary art and time, for example. And, of course, the most wonderful Art and Therapy by Alain de Botton and John Armstrong. I already have three books in store for next year, so there will be more to come in 2018. More books, more Wang Bing and who else? We will see that soon! I wish all of my readers a peaceful end of the year, a Happy New Year in advance, and you’ll hear from me again very soon!! The work you do is so vital, Nadin. You inspire me to seek out the various films that you watch. I’m already a huge fan of Wang Bing and Chantal Akerman, but your posts remind to keep exploring their work. I’ve heard of Roy Andersson but didn’t know about the trilogy. I’ll definitely keep it in mind. Your website is an important resource for cinephiles around the work. Keep up the great work! Thank you so much, Caitlin! I appreciate your support. Maybe we should have a proper chat one day over Skype. Nadin you must watch Roy Andersson’s short film, World of Glory. It is only 15 minutes but I think its a phenomenal piece of work.